Generally speaking many spearfishermen wear too much weight. This causes two problems. First, if they were to black out they would end up on the bottom of the ocean and second, it can reduce their dive time. When I started freediving back in 2006 I was terrible. I’d freedive to the sand at Sombrero Reef at 20ft., I’d be there for about 15 seconds, have the urge to breathe and I’d fly to the surface. I decided that I was spending too much energy getting to the bottom thinking if I just added more weight, it would make it easier to get there. I’d get two 6 pound weights put them on my belt and go freediving. This by the way was with no wetsuit. As a new diver I had poor technique. My entry was terrible, my fins were splashing around, and I was going down at a 20 degree angle, so I wasted tons of energy getting to the bottom. At the time I had no idea my technique was poor, but I knew it was hard to get down there so adding extra weight seemed like a logical next step. Overweighting is a crutch for poor technique. If you have bad technique and then add too much weight it’s, of course, easy to get down to the bottom. 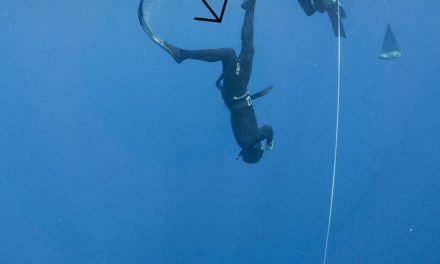 The problem is divers need to make as many ascents as descents, so you have to kick the extra weight back to the surface. When you are spearfishing, unless you always stone your fish, you will often have to fight a fish to the surface as well as carry up extra weight if over weighted. Here is the other issue, if you are really over weighted you can’t properly rest at the surface. You will have to exert energy kicking or sculling your fins just to keep your snorkel above the waterline. This will raise your heartbeat and reduce your bottom time on the next dive since you are unable to properly relax. 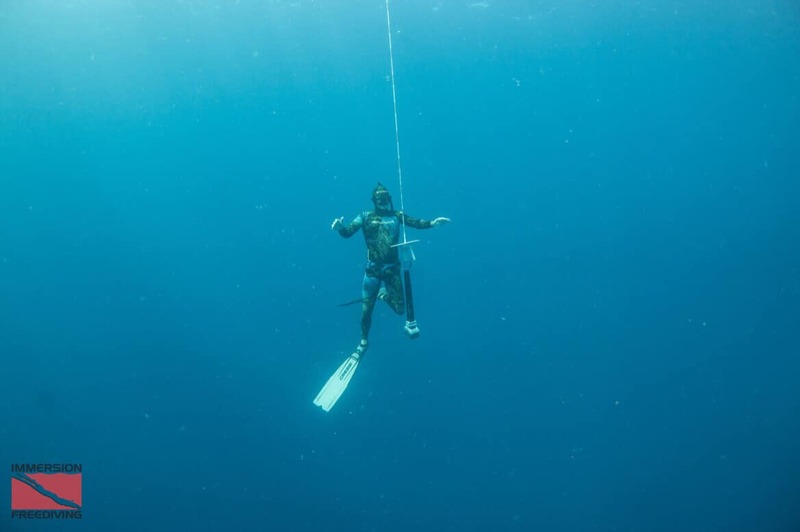 My way of weighting allows you to spend zero energy floating on the surface reducing your heart rate making it easier to stay down longer on your next dive. Extra weight makes it easy to go down but it makes it just as hard to come up. From a safety stand point it makes sense to do your dive the opposite way. It should be more work going down and less work coming up. You don’t want to be doing the most amount of work as you are coming up through the danger zone. Most blackouts happen 15ft from the surface. The question becomes how much weight to wear? If you were to black out you would not blackout with a lung full of air. Your throat would temporarily open and you would do a relaxed exhale, exactly as if you did a sigh. 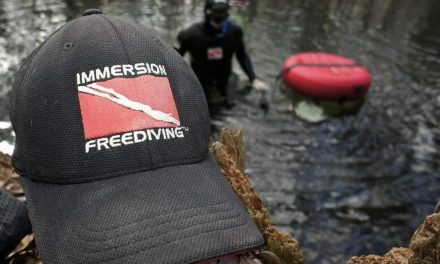 If you want to test if you would end up on the bottom of the ocean when blacking out, jump in the water wearing your normal gear. Do a relaxed exhale (like a sigh) and then don’t move your feet or hands. If you continually sink to the bottom on a relaxed exhale you would end up on the ocean floor if you blacked out, this is failing the surface safety test. Remove weight until you do not continually sink on a relaxed exhale. Be Neutrally Buoyant at 33ft. 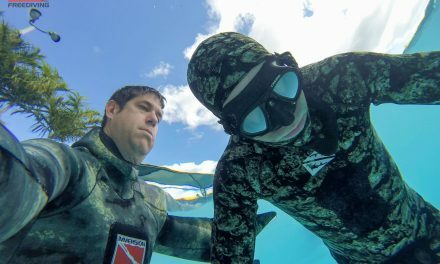 Freediving agencies train their students to be neutrally buoyant at 33ft. This means if you go down to 33ft. you should neither float nor sink. Dive down to 33ft. by using your depth gauge or a line off the boat. Once you get to 33ft. stabilize yourself and stay motionless for a full 10 seconds. You should not be floating up or down in the slightest. If you are adjust your weight accordingly. Now as long as you are diving deeper than 33ft. you won’t need to spend any energy staying on the bottom as you will become more and more negative when you dive past 33ft. This works perfect for spearfishing deeper than 33ft. Less weight is better! Be close enough to grab your buddy when they surface so if anything happens you could actually do something about it as opposed to being 100ft. down the reef.